If you don't have a pet sourdough starter of your own, you can use the instructions here to create one. It's really simple but don't be disheartened if it dies - I'm currently on my fourth starter and I'm sure it was nothing I did that led to the deaths of the previous ones. Hmmm maybe my parents knew what they were doing when they wouldn't buy me a puppy. 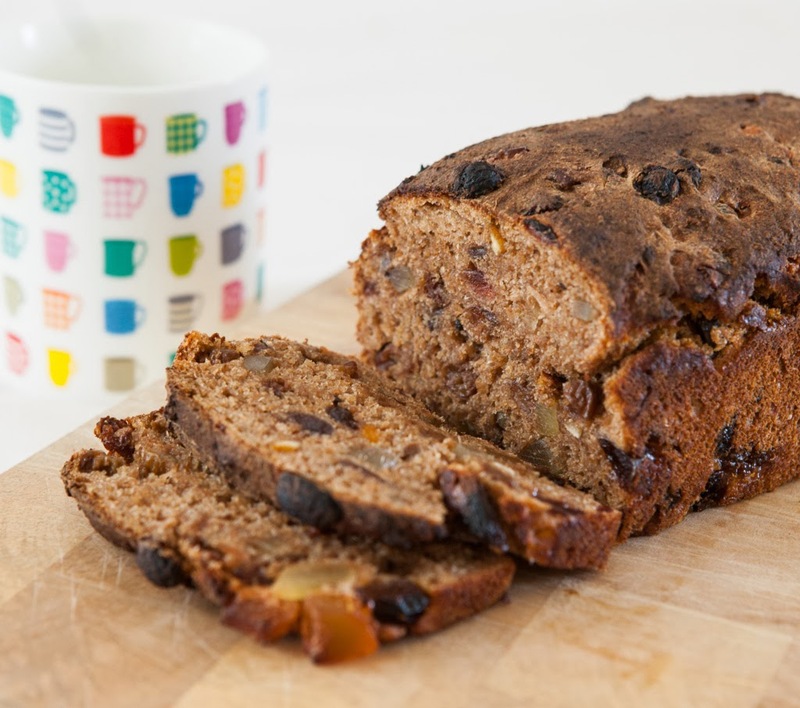 This tea bread is sweetened by the addition of glace fruit and is a great mid-afternoon snack especially when served with butter. Mix together the sourdough starter, spelt flour and water in a bowl and leave at room temperature. This is known as the ferment. In a separate bowl soak the mixed peel and sultanas in the cold tea and leave at room temperature. Reserving the tea, drain the peel and sultanas and place in a large mixing bowl. Add 100 millilitres of the tea to the bowl. If you have insufficient tea, make up the difference using mineral water. Discard any excess tea. Add the ferment to the mixing bowl. Add the stem ginger, glace cherries, salt and rye flour. Using a Kitchen Aid with the dough hook attachment, kneed the mixture for 15 minutes on a medium setting. Cover the bowl with a tea towel and set aside for two hours or until the mixture has doubled in size. Grease a 1 pound loaf tin with light tasting vegetable oil. Add the loaf mixture to the tin and smooth with a palette knife. Leave to rise until it reaches the top of the tin. This will take in the region of 1 hour. Pre-heat the oven to 220 Centigrade. Place the loaf tin in the oven on the middle shelf. Fill a baking tray with water and place this on a lower shelf to create steam. Bake for 35 minutes or until the loaf sounds hollow when tapped. During this time, add more water if the baking tray is drying out. Leave the loaf to cool in the tin for five minutes. Carefully remove the loaf from the tin and leave it to cool on a wire rack. Once cool, wrap in greaseproof paper and leave to rest for a day (it tends to have a weird gummy texture on the day of baking). Your loaf is ready to eat. Totally psyched to find another way to use my sourdough starter up yay! Still new to the world of sourdough so I've much to learn.... i was wondering if its possible I could bastardize your recipe with malt extract to make a sweeter tea loaf as the other half has quite the sweet tooth.